kt literary » Blog Archive » #KTLitRetreat15 roundup! We’ve been back almost a week already, and I still have laundry to fold, but I wanted to share some thoughts about the 2015 KT Literary Agency Retreat before they’re completely stale. First of all, as always, it’s a genuine pleasure to spend time with my colleagues and our clients. We’ve been super lucky in finding authors to work with who are not only talented, but great people, and fun to hang out with. 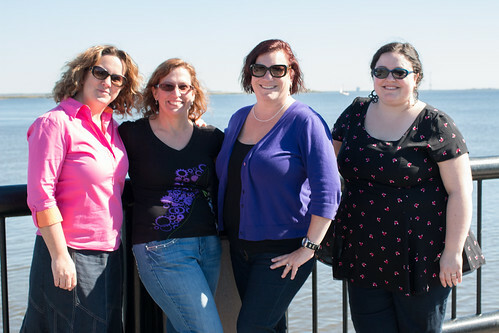 In the last few years, we’ve done retreats in Estes Park, CO; Portland, OR; Winter Park, CO; and now Charleston, SC. Each one was a little different, and each one was a great experience, whether it focused more on isolation and relaxation, or tourism and excitement. We picked Charleston to coincide with YALLfest, a fantastic YA event held annually here. (Early this year, they also expanded to YALLwest, in Santa Monica.) 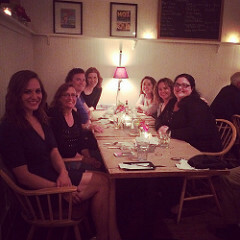 We were able to not only enjoy amazing food, fantastic company, a ghost tour, enlightening talks about writing, macaroons, a carriage ride, and some Southern hospitality in the form of fabulous warm weather in November, but also hear other authors speak on World-Building, Jealousy, Strong Female Protagonists, and more. Dropping by the Industry Insiders panel, we also heard from three other agents and two editors, who shared their advice and opinions. Not every literary agency hosts a retreat, and it shouldn’t be a factor in making a decision about who to sign with. But it is a bonus, I think. Getting to spend several days with our authors, hashing out issues with manuscripts or editors, talking over ideas, even just being able to celebrate a deal in person, over a glass of bubbly, makes it worthwhile for me. Next year, I think we’ll head to somewhere a little more remote again, but we’ll definitely do it again and again and again! If you’re interested, you can check out my whole album of pictures from the trip on Flickr below, or search the #ktlitretreat15 tag on Instagram. And who know, maybe next year, you’ll join us! ← #GiveABook campaign live NOW through Dec 24!